In 11 days Rueben Hesketh Casimir will be 100 years old. Really? Yes indeed. Born on Hillsborough Street, Roseau on 30th October 1918, to Roselia Nicholas of Roseau and Wilfred Casimir of Trafalgar, Hesketh is best known for his extraordinary service to Dominica through the Music Lovers Government Band that he helped create in June 1951 and led as Band Master for more than 36 years. How would Casimir account for becoming, in two weeks, Dominica's latest of more than 20 centenarians? 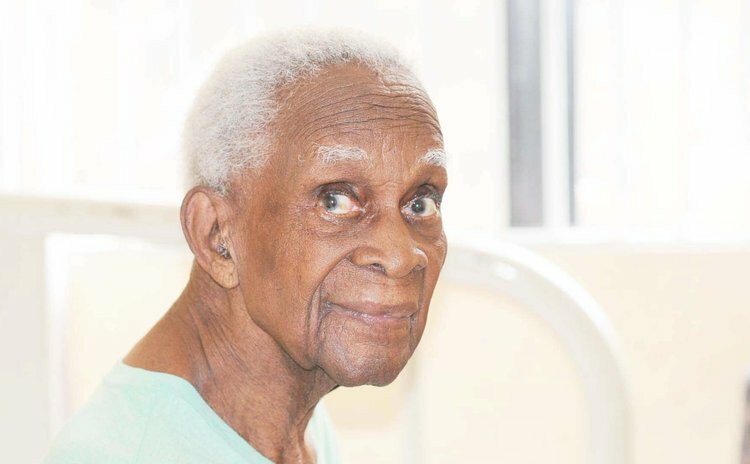 "My father lived to 95; my aunt Agnes in America lived to 98; I had a lot of nonagenarians in my family," said Mr. Casimir in an interview with the SUN last week at his home in Goodwill. "I'm the first centenarian; if I live. I didn't think I would ever be that age, you know". Of course no one can be sure, but Hesketh will likely live beyond 100. He's in relatively good health; he walks around his home with the help of a walker but he has some difficulty with his hearing. His sight? Near perfect, for a 100 year old. "That's me there; there's Bing's father; that little boy there is Bing's brother," Hesketh says unhesitatingly as he points to images on a framed black & white photograph. Nearly ten decades ago, young Hesketh attended the Maria Casimir preschool followed by Roseau Boys School at Newtown and then the Roseau Mixed School. Because his parents were poor it was unlikely that he would attend the Dominica Grammar School until the Catholic Church directly entered the business of providing secondary education. "Bishop Morris decided to have the Saint Mary's Academy because a number of us our parents could not afford to attend the Grammar School," said Casimir. The late Frank Baron, the first premier of Dominica, was his school mate. After leaving school Casimir's first job was with T. D. Shillingford, a variety store; then he was employed by the CDC, the precursor of DOMLEC, the producers and distributors of electricity before starting his own store selling books, magazines and stationery on Cork Street, Roseau. Hesketh's association with music began when he was a member of the Casimir Brothers, a band involved in playing at dance events "all over the place", Casimir said. He played the saxophone. But most significantly, Casimir taught himself music and did not attend music school. Bing Casimir, Hesketh's nephew, and a current member of the popular Swinging Stars band, also wanted to play the saxophone because many members of the Casimir family played that instrument. "I said to Bing, listen, you're not going to play saxophone. You have to play trumpet," Hesketh said. And Bing has played the trumpet up to today. When World War II began, Casimir joined the Dominica Defence Force but he did not actually engage in battle. While in camp, he remembers being the recipient of dangerous prank. "While I was asleep Ron Green and George Alleyne, they poured mercurochrome in my ears. In my ears!" he said. Eating natural foods and having lots of exercise are usually citied as ingredients for longevity but in Casimir's case that may not be so. "I'm not difficult to feed," Casimir said. "I eat everything." As a young man Casimir exercised by played cricket and football with persons like Oscar "Popeye" Joseph, himself a centenarian, in the mouth of the Roseau River then known as the Boushwe. At 100 years old what are Casimir's regrets? He said one of his major disappointments was his failure to influence successive Governments of Dominica to allocate a permanent venue for the Music Lovers Government Band for practice and to store its musical instruments. For decades the band practiced at his home. "The only time they want us is when they have a function," he said. "I don't think they have a place up to now." Nonetheless, Hesketh Casimir has been honoured twice by the Government of Dominica- he received the Sisserou Award of Honour in 2000 and the Meritorious Service Award in 1973. The Government Band itself received the Sisserou Award of Honour in 1981. Twice married, Casimir has two children- Roslyn and Rene.